The orangefoot pimpleback pearlymussel is a rare freshwater mussel believed to be found in the lower Ohio River in Illinois, the middle reaches of the Cumberland River, and the lower reaches of the Tennessee River in northern Alabama and western Tennessee. Freshwater mussels are marine mollusks that are able to move slowly through the sand, gravel, or silt of their aquatic habitat by means of a muscular foot. 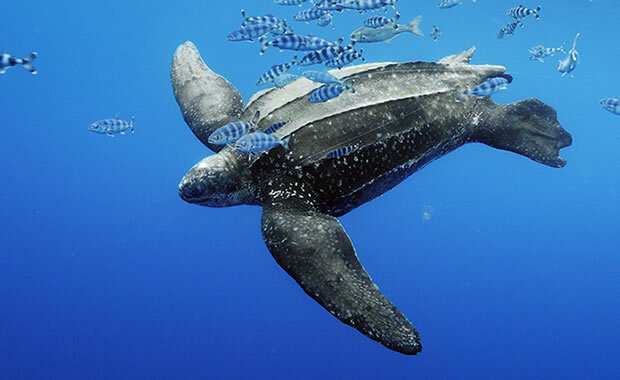 They have a close-fitting shell that protects them from predators and drying out when high up on the shore. The orangefoot pimpleback reaches up to 100mm in length, and it has a rayless, light brown shell that becomes darker as it matures. As its name suggests, the foot of the mussel is orange in color. 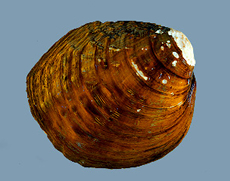 This mussel prefers clean, fast-flowing water in silt-free rubble, gravel or sand of medium to large rivers with steady currents. They can be found buried in sand or gravel in water as deep as 29 feet. Young mussels are born as "glochidia" (larvae) until they undergo metamorphosis into mussels. As larvae, they develop by attaching themselves to fishes for a short life as parasites. The process is further complicated because not only do the glochidia have to find a fish, but it has to be one of several fish species for the life cycle to continue. The main host fish of this species is unknown. As mussels, they attach themselves to the river floors and feed on plankton and detritus that they are able to filter from the water using specialized regions of their shells. The water is filtered over the gills and the food particles become trapped and eventually digested. In the spring, males release sperm into the water when the current is strong enough, allowing the sperm to travel and reach the eggs inside the shells of females. The fertilized eggs then develop into glochidia and grow inside the gill of the female until released into the water. In order to completely develop as mussels the larvae must find the host fish and attach themselves to its gills. Many historic populations of this species were wiped out due to human disturbance of its aquatic habitat. River sections they inhabited were confined by the building of dams and reservoirs, flooding most of their habitat. This resulted in a reduction of gravel and sand and more than likely affected the population of their fish hosts. Threats to the remaining populations are water pollution and sedimentation due to deforestation, and competition with the introduced zebra mussel species. This species was listed as endangered in 1976, but currently, there are no recovery or habitat conservation plans. Copyright Notice: This article is licensed under the GNU Free Documentation License. It uses material from the Wikipedia article "Orange-footed pimpleback mussel". Glenn, C. R. 2006. "Earth's Endangered Creatures - Orangefoot Pimpleback Pearlymussel Facts" (Online). Accessed 4/23/2019 at http://earthsendangered.com/profile.asp?sp=761&ID=9. Need more Orangefoot Pimpleback Pearlymussel facts?